Diablo III is now in between seasons! Season 1 ended on Tuesday, while Season 2 will start up on Friday, February 13. Seasonal heroes were converted to the non-Seasonal side, and items from Season 1 are delivered in the in-game mailbox. All the Legendary items introduced in Season 1 are now available and dropping for all characters. Players can look up a Diablo III BattleTag at Diablo Somepage, to view the Paragon Level progress converted over from Season 1. All Season 1 characters were transferred over and are no longer considered Seasonal. Instead, they are in the standard pool of non-Seasonal characters. Any items in the Seasonal stash were mailed over in the Diablo III game, and can be obtained through the mailbox button in the bottom left of the screen in game. A window opens up with information on each item, and the player can select to transfer the item into the regular stash, or delete the item entirely. There is not a confirmation button when making this selection; as noted in a blue post when the season was ending, players should be very careful to not accidentally delete an item they meant to keep! Season 1 is scheduled to end at 16:00 CET today in Europe and we wanted to quickly remind everyone to be mindful when claiming items from the in-game mail system. Items that are currently stored in your seasonal stash will be delivered through this system and you will be presented with the option to claim or delete each individual item. Please make sure to select the correct option, especially for those valuable legendaries you fully intend to keep for your future demon-slaying endeavours. More information on the season roll including a short and handy guide on how to access the in-game mail system can be found in our blog: End of Season: What to Expect. After a Diablo III account that had Seasonal Paragon Levels has been relogged in the game, the battle.net data will update to combine the Paragon experience into the normal non-Seasonal Paragon Levels. Here at Diablo Somepage we are updating data on the millions of Diablo III characters we track, and all their accounts. As seen in the Paragon Level ranking, the combined experience once again puts Gabynator#1902 at the top of the Paragon Level rankings. 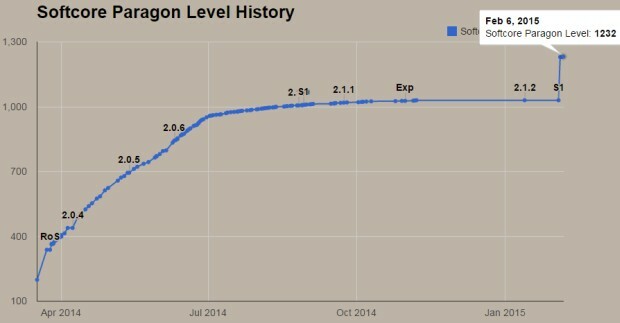 The history of Paragon Levels for that account can be seen above, with all the Seasonal Paragon Levels transferring over and bringing the current Paragon Levels for Gabynator#1902 up to 1,232! Players can use the BattleTag Locator to pull up their account and history of Paragon Levels, or add themselves to our Diablo III data. While we are automatically working through all the Diablo III accounts that we track, any player can manually look up their account and instantly update it, to get the very latest data reflected in the Paragon Level history. We will be updating the Diablo Somepage site throughout the coming week to clear out old Season 1 references, and prepare for the arrival of Season 2 on Friday, February 13. Season 2 will bring new Seasonal Legendary equipment and gems, and a fresh start all over again!